At Brau Beviale 2016, Gebo Cermex unveiled the Agility 4.0™ programme. By increasing the productivity of beverage manufacturing plants, making them more connected, flexible and responsive – in a word, agile – this Advanced Production Systems programme plays a major role in making the factory of tomorrow a reality today. As we move towards the era of Industry 4.0, the smart factory has become an important and much-discussed topic in manufacturing, highlighted by the trend for an increasing use of automation, cyber-physical equipment and computerised systems for the acquisition and processing of data.The beverage market is changing fast. With distribution looking for more customised delivery methods and increased responsiveness, and with people showing different consumer behaviours that influence their purchasing decisions, the packaging industry needs to find new ways to improve line operations in terms of speed, efficiency, flexibility and versatility. At Brau Beviale, Gebo Cermex demonstrated its contribution to the factory of tomorrow, addressing in particular the requirements of the beer, wine and spirits market – one in which the company has more than 50 years of experience. The company showed its leadership by offering customers increased performance via four steps in its asset management model based on design, build, maintain, and improve. At Gebo Cermex, designing a line concept has long been – and is still – a matter of expertise and one that helps to resolve the current challenges of Industry 4.0. Given the complexity in developing bottling and canning plants to distributors’ expectations, it is now up to computer generated modelling to solve the future challenges of Industry 4.0. By combining its extensive knowledge and the power of computerised systems, the company has successfully brought the virtual factory to life. It is now possible to accurately simulate daily operations in a production plant, and therefore develop and test new production models, such as the dematerialised layout. This substitutes traditional packing solutions with intralogistics by linking small specific production islands with automatic guided vehicles handling either semi-finished or finished goods. In this way, production can be customised on a mass scale without changing costs. It is a breakthrough concept that breathes ‘agility’ and which visitors were able to experience live via a Virtual Reality demo. Sustainable production processes and the role that optimising energy usage plays are becoming ever more important in developing the factories of the future. How energy is being consumed and the carbon footprint created by a packaging line are now central factors in purchasing decisions. 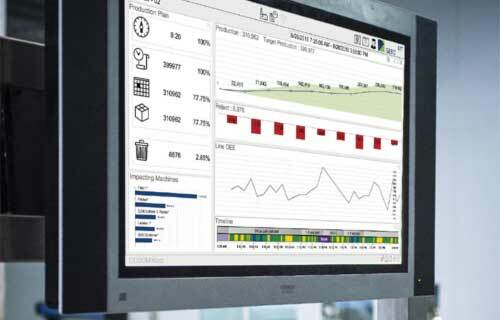 The energy consumption simulation tool introduced as part of the Agility 4.0 programme can be used to audit existing installations or to assist in the design of new ones. It enables beverage producers to test a wide range of possible configurations, validate design variants and optimise energy saving proposals. It can be used in conjunction with the Eco Audit service from Gebo Cermex to help significantly improve the environmental performance of a beverage producer’s line. With water an increasingly important resource, focusing on water management, particularly in relation to tunnel equipment such as pasteurisers, is also an important part of the sustainability equation. Contributing to this are the many features of the SWING® pasteurising system, now available as an upgrade for standard Gebo Cermex pasteurisers. Coupled with the PRINCE Plus pasteurising software, most recently enhanced with an Energy Advanced Diagnostic module, it offers a pasteurising solution which achieves the greatest water savings on the market. To achieve the lowest total cost of ownership (TCO) of invested equipment, effective and connected maintenance and troubleshooting are vital in helping to reduce costly downtime, particularly given the increasing sophistication of packaging lines. The conveyor monitoring software is a significant step toward the creation of the connected factory. It gives real-time views of the whole line’s conveyor running status, also providing preventive maintenance instructions and automatically generating email alerts listing the parts to be replaced, thus ensuring the continuous running of the line. No less important, in the event of a broken part, easy online ordering is just a click away. In addition, Gebo Cermex now offers Remote Video Assistance, which uses video, audio and augmented reality technology. The audio and video facilities allow Gebo Cermex experts to better understand the issue through real time viewing from a remote location, almost as if they were on-site. The augmented reality then allows a full explanation of the problem and, more importantly, provides the assistance in how to resolve it. The operator on-site can see the hands and the tools used by the Gebo Cermex expert, superimposed on the operator’s view, thereby providing precise visual guidance in what actions to take while the verbal instructions are given via the audio facility. It is difficult to improve what is not being measured. This simple truth is at the heart of EIT™, a packaging line Efficiency Improvement Tool that serves as the best example of the value that the connected factory can create. It is a powerful real-time supervision system, permanently monitoring key machine performance indicators, product flows and accumulations, as well as consumptions. However, having a system recording production data and events, providing visual dashboards and comparing performance is not enough. The market is looking for systems with “built-in intelligence” capable of translating raw data into actionable information. EIT™ handles production issues to meet ongoing challenges and also anticipates them through trends and forecasts based on historical and multi-plant analysis. The outcome is clear: beverage producers reduce losses, reach their production objectives and set their priorities in the long run. Part of the Sidel Group, Gebo Cermex has some 37,000 equipment and system installations operating throughout the world, bringing advanced performance and greater agility to packaging lines. Leveraging more than 50 years of experience, the company offers solutions in complete packaging line engineering, equipment design manufacturing and integration, material handling and end-of-line packaging. Ludovic Tanchou, Vice President Strategy, Products and Innovation at Gebo Cermex, said – “Gebo Cermex is an innovative leader in delivering packaging solutions in PET, can and glass liquid packaging and material handling. Through the latest developments in our Agility 4.0 Advanced Production Systems programme, we are now offering a pragmatic answer to the new challenges the packaging industry is facing: greater performance and agility, backed by extensive engineering expertise.